False Colour Composite of the Black Rock Desert, Nevada, USA. Image acquired on 6th April 2016. 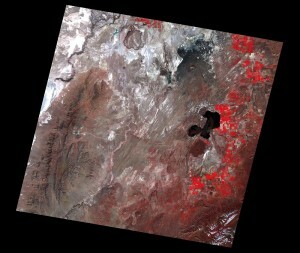 Data courtesy of NASA/JPL-Caltech, from the Aster Volcano Archive (AVA). Last week, the US and Japan announced free public access to the archive of nearly 3 million images taken by ASTER instrument; previously this data had only been accessible with a nominal fee. ASTER, Advanced Spaceborne Thermal Emission and Reflection Radiometer, is a joint Japan-US instrument aboard NASA’s Terra satellite with the data used to create detailed maps of land surface temperature, reflectance, and elevation. When NASA made the Landsat archive freely available in 2008, an explosion in usage occurred. Will the same happen to ASTER? As a remote sensing advocate I want many more people to be using satellite data, and I support any initiative that contributes to this goal. Public satellite data archives such as Landsat, are often referred to as ‘free data’. This phrase is unhelpful, and I prefer the term ‘free to access’. This is because ‘free data’ isn’t free, as someone has already paid to get the satellites into orbit, download the data from the instruments and then provide the websites for making this data available. So, who has paid for it? To be honest, it’s you and me! The Sentinel satellites, under the Copernicus missions, are funded by the European public. In addition to making basic data available, missions often also create a series of products derived from the raw data. This is achieved either by commercial companies being paid grants to create these products, which can then be offered as free to access datasets, or alternatively the companies develop the products themselves and then charge users to access to them. Spectral wavebands / frequency bands – wavelengths for optical instruments and frequencies for radar instruments, which determine what can be detected. Spatial resolution: the size of the smallest objects that can be ‘seen’. Revisit times: how often are you likely to get a new image – important if you’re interested in several acquisitions that are close together. Long term archives of data: very useful if you want to look back in time. Availability, for example, delivery schedule and ordering requirement. We don’t want any client to pay for something they don’t need, but sometimes commercial data is the best solution. As the cost of this data can range from a few hundred to thousand pounds, this can be a challenging conversation with all the promotion of ‘free data’. So, what’s the summary here? If you’re analysing large amounts of data, e.g. for a time-series or large geographical areas, then free to access public data is a good choice as buying hundreds of images would often get very expensive and the higher spatial resolution isn’t always needed. However, if you want a specific acquisition over a specific location at high spatial resolution then the commercial missions come into their own. Just remember, no satellite data is truly free! This entry was posted in Copernicus, Data, Earth Observation, Education, GMES, MODIS, NASA, Remote Sensing, Sentinel, Space Industry, Understanding Space and tagged Advanced Spaceborne Thermal Emission & Reflection Radiometer, ASTER, Buying Satellite Data, commerical data, Consultancy, Copernicus, free data, Help with satellite data, Japan, Landsat, NASA, pixalytics, revisit time, Satellie Data Consultancy, Satellite data, Sentinel, spatial resolution, spectral wavebands, Terra, US by Sam. Bookmark the permalink.